This program is fun!!! Viking’s youth Multi-Sports programs have kids playing a variety of games including dodgeball, capture the flag, tag, soccer, and floor hockey (just to name a few…). 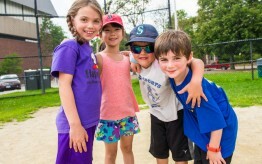 Our Multi-Sports programs focus on fun sports and games. Most importantly, these programs are about constant playing! If you seek a program that offers a mix of traditional instruction, skill development that is reinforced with scrimmages, try one of our multi-sports clinics. All players receive a Viking Sports T-shirt. *Rain Out Policy: We build ONE rain out into the class, and begin making classes up after the 2nd rain out of the season. Looking For More Viking Programs?